The Algerian army has killed one of the militants responsible for the beheading of a French hiker in September, the country's justice minister says. Tayeb Louh made the announcement on Wednesday after an investigation into the murder of hostage Herve Gourdel. The unnamed jihadist was killed in an anti-terrorist operation in October. Jund al-Khilafa, an Islamist militant organisation allied to Islamic State (IS), killed Mr Gourdel in September following French air strikes in Iraq. 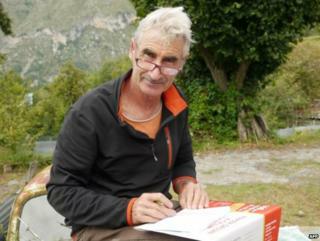 Mr Gourdel, 55, was from Nice, and was kidnapped after the militants stopped his vehicle in a remote area east of Algiers where he had intended to go hiking. In a video released by the jihadists, they announced his death after an ultimatum issued to the French government to cease its airstrikes against IS militants in Iraq. French President Francois Hollande condemned the killing as a "cruel and cowardly" act, and said that French air strikes, which began on IS targets in Iraq earlier in September, would continue.